In my ongoing effort to use up the thyme I had bought for the turkey soup, I found a recipe for Roasted Chicken with Lemons and Thyme. I've been jonesing for some roast chicken for a while now, so I stopped in at the Apple Market and bought a big beautiful capon. The recipe called for a six-pound baby; that's about six-and-a-half pounds sitting in my roasting pan. It wasn't too hard to loosen up the skin around the breast, but it felt really weird working my way down to the drumsticks and thighs. I wasn't terribly successful at getting the spices and lemons all the way down to the thighs. The roasting chicken filled my apartment with the most amazing smells - the chicken itself, laced with the lemons, thyme and paprika. I bought some Hungarian paprika especially for this dish. I've been using the smoked Spanish paprika for so long that I was worried I wouldn't be able to detect any flavor in the Hungarian, but it was strong enough in its own right and has a wonderful, deep flavor that I will use in other things. Sometimes the smoked paprika overwhelms; it's nice to have one that blends a little more. I pulled the chicken out when the thermometer read 165 degrees, just like the recipe said, then let it sit for about 15 minutes so the juices could settle. But when I went to carve it, I could tell that it still wasn't quite done. It looks done, doesn't it? As a matter of fact, the skin is about as close as you can get to being burnt without being burnt. But I covered it up with foil, put it back in the oven and cooked it for another half an hour. That did the trick, and since I hadn't started cutting into it yet, it didn't dry out when I put it back in the oven like the turkey did. 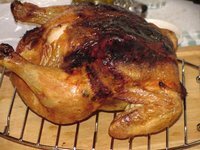 I have come to two conclusions based on my recent poultry-roasting adventures: 1) I need to work on my roasting techniques and 2) I need a better oven thermometer. I think I'm going to get one of those digital thermometers that plug into the meat but stay outside of the oven. Bottom line? It was a little disappointing. For all of the lemon, thyme and paprika this recipe uses, the chicken was pretty bland. The skin, which you're supposed to discard but looked too good to resist, was the best part and is where all of the flavor went. I will continue my roasting efforts because I want to master this, but I don't think I will be working on this recipe any more. There was nothing wrong with it, but the payback was insignificant given the richness of what went into it. Preheat oven to 425 deg. 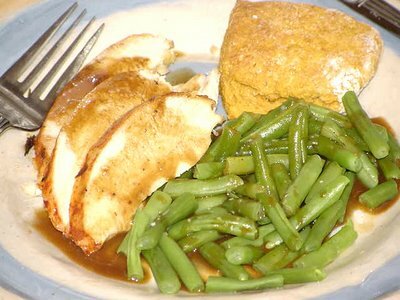 F.
Place chicken on the rack of a broiler pan or roasting pan coated with cooking spray. Brush oil over skin. Cover chicken with aluminum foil. Bake at 425 deg. F. for 30 minutes. Uncover and bake 50 minutes or until an instant-read thermometer inserted into thigh registers 165 degrees. 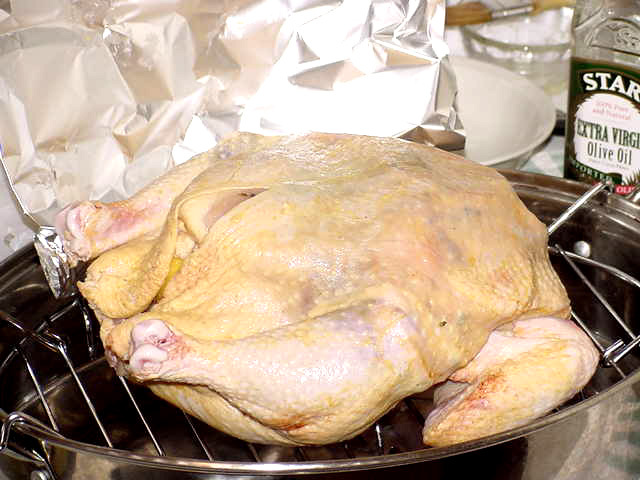 Transfer chicken to a cutting board; cover with foil, and let stand 15 minutes before carving. Place a zip-top plastic bag in a 2-cup glass measure. Pour drippings into bag; let stand 10 minutes (fat will rise to the top). Seal bag; carefully snip off 1 bottom corner of bag. Drain drippings into measuring cup, stopping before fat layer reaches opening; discard fat. Place pan on stove top over medium heat. Sprinkle flour into pan. Add wine; bring to a boil, stirring constantly with a whisk. Add drippings, broth, juice, sugar, remaining 3/4 teaspoon pepper, and remaining 1/2 teaspoon salt to pan, stirring constantly with a whisk until slightly thickened. Remove from heat. If I may, I learned that if I want really juicy breast meat, I cook the chicken upside down for the first half of the cooking time. It makes a big difference. I rough chop an onion, a lemon, and a few cloves of garlic and whatever spices I am using and stuff it all in the cavity and roast the chicken like that with plenty of salt and pepper. The problem with this particular chicken though, wasn't that it was dry, Lisa Jean. 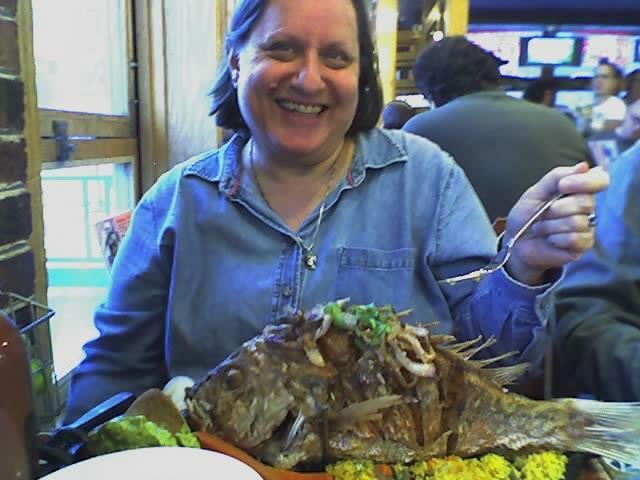 It just wasn't very flavorful given all of the thyme, paprika and lemon I stuffed under its skin and into the cavity. But I have heard of your method and plan to give it a try while I'm mastering the art of roasting. I'm not giving up yet! 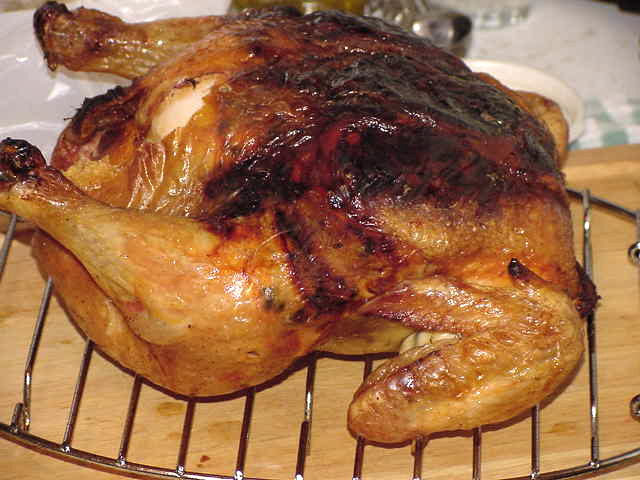 I am going to send you the Nigel Slater roast chicken recipe, it is the best that I have ever used (in fact it is the only one I use these days), and it is very like this, only even more basic, and it never ever fails. And if you deglaze the pan with vermouth it is heaven on earth. Please do, misreall. I'd love to try it.